Elegant veal Oscar is traditionally made with veal medallions, but this Stuffed Filet Mignon Oscar rendition is even fancier. Thick-cut filet mignon steaks replace veal. But, in keeping with tradition, crab and Béarnaise Sauce are still on the scene. 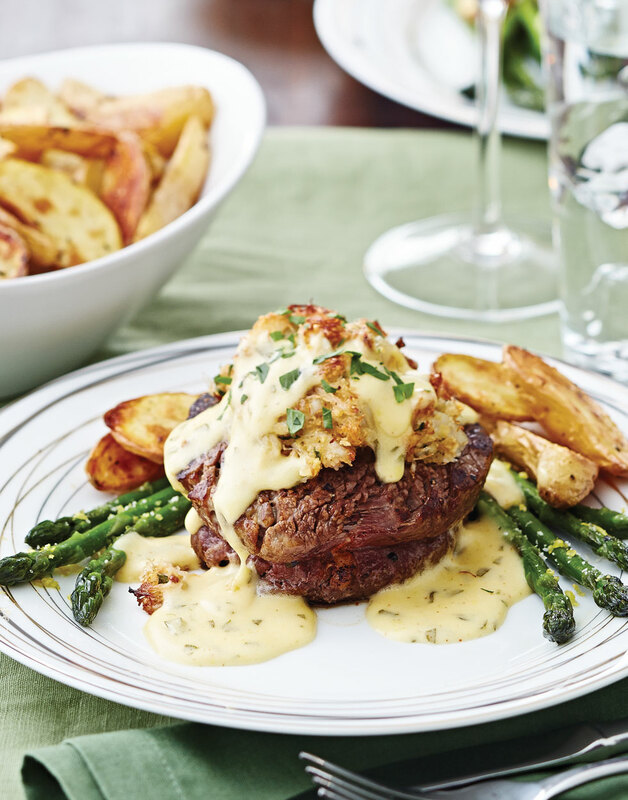 This impressive variation employs the technique of stuffing the filets with mouthwatering crab and serving velvety béarnaise on top. Simple sides, like roasted potatoes and sautéed asparagus, a classic garnish for Oscar, are all you need to complete this amazing meal. Stuffing the filets is a two-step process. First, create a pocket by cutting an “X” halfway through each filet. Second, make more space inside the pocket by snipping the points of the “X,” then all you have to do is stuff, roast, and let the filets rest. For the filling, combine mayonnaise, cracker crumbs, Parmesan, parsley, dry mustard, Old Bay, Worcestershire, and lemon juice. Add crabmeat; toss gently with hands to combine. For the beef, heat oil in a sauté pan over medium-high until it shimmers. Sear filets, 5–6 minutes per side. Transfer filets to a rack to cool, 15–20 minutes. Preheat oven to 400°. Arrange a wire rack inside a baking sheet. Cut an “X” into top of each filet to create a pocket. Avoid cutting through the sides or bottoms of steaks. Lift each of the points of the “X” from the center and snip halfway down to increase pocket size. Stuff 1–2 Tbsp. filling into each pocket, then top each filet with about &frac13; cup more filling. Arrange filets on prepared baking sheet and roast 20 minutes for rare. Transfer filets to a cutting board, snip string, tent with foil, and let rest 5 minutes before serving with Béarnaise Sauce. Tying the filets helps them hold their shape as they cook. Trim the ends of the string before cooking filets, then snip off before serving. Using the tip of a sharp paring knife, cut an “X” into each seared filet. Be careful not to cut through the sides or bottoms of the filets. To hold more filling, increase the pocket size inside the filets by lifting each point of the “X” and snipping halfway into the filet. Quarter the crab mixture, and use a spoon, or your fingers, to push the filling into each pocket, then pile more on top. A simple side of asparagus lets the main course shine and provides a helping of vegetables to the meal.